The Joaquín Achúcarro Foundation is proud to announce that Cuban native and Legacy Pianist Dario Martin will begin the “A Salute to My Native Cuba and Our Spanish Roots” tour this fall. Beginning September 11 at the Centro Cultural Español (CCE) in Miami, Florida, the tour will celebrate the pianist’s unique style and musical repertoire that references his cultural roots. The first half of the performance will include Cuban selections, while the second half will reference Spain’s musical influences. With this series, the Joaquín Achúcarro Foundation celebrates the rich shared cultural heritage of Spain, Cuba, and the United States. This is a particularly timely opportunity, given the newly defined relationship between Cuba and the United States. The tour will continue in San Antonio, Texas at the University of Texas at San Antonio on October 16 and conclude in Dallas, Texas at the Latino Cultural Center on October 29. All three performances are free and open to the public. ‘Sorolla and America’, A Musical Imagery with Pianist Marta Espinós was recently performed for two nights only in Madrid, Spain, at the Museo Sorolla on September 21-22. RSVP via email at rsvp@sdmart.org or call Ariel Cowen at 619.696.1920. Kindly reply by August 13, 2014. A SELECTION OF THE BEST SPANISH PIANO MUSIC THAT ILLUSTRATES THE SPIRIT AND CONTENT OF SOROLLA AND AMERICA BY CREATING AN AUDIOVISUAL, CROSS—DISCIPLINARY PARALLELISM. This recital provides a full aesthetic experience by revealing analogies between the Luminism in Sorolla and Impressionism and Nationalism in music—a great opportunity to celebrate the universality of Spanish art. The musical program comprises a selection of piano music directly connected to the exhibition topics: the sea, the harbor, children playing at the beach, corners of Andalucia, gardens and other scenes of Sorolla’s imagery. It encompasses all the great Spanish composers, both contemporaries of Sorolla and the subsequent generation: Albeniz, Granados, Falla, Turina, Espla, Mompou and Rodrigo. One of the legacy pianists of the Joaquin AchUcarro Foundation, Marta Espines studied under Maestro Achlicarro in the Artist Certificate and Masters program at the Meadows School of the Arts at Southern Methodist University in Dallas. Currently residing in Madrid, Marta stands out as one of the most unconventional figures of the Spanish musical scene and performs as a soloist in celebrated venues across Spain, the U.S. and other countries. 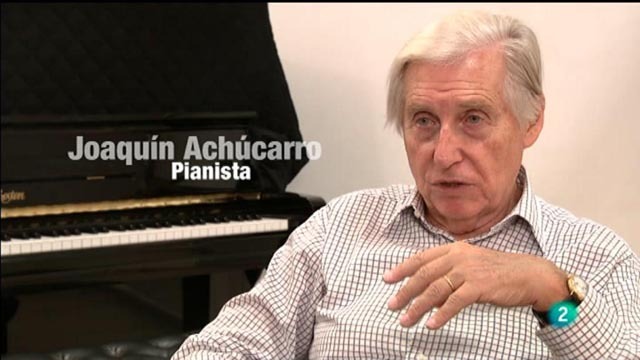 The Joaquin Achiicarro Foundation is a nonprofit organization founded to showcase, educate, and benefit the careers of pianists, while developing and maintaining the legacy of Spanish pianist Joaquin Achncarro in perpetuity. This concert is sponsored by the Joaquin Achiicarro Foundation in cooperation with the Program for the Internationalization of Spanish Culture (PICE) with the support of Accion Cultural Espanola AC/E and Spain Arts and Culture, the official Spanish cultural program in the U.S.
Joaquín Achúcarro doesn’t like being told he has had a long career. “My career is just beginning,” insists the pianist, who performed last week with the Dallas Symphony Orchestra. In many ways, he’s right. Achúcarro has recently released two DVD recordings with the London and Berlin Philharmonics, and his touring schedule remains ever busy.